Should the power grid become compromised because of ice/sleet/snow, be prepared! Winter Storm Warnings have been posted for the entire 13News viewing area. A Winter Storm Warning is issued when severe winter weather is expected within the next 24 hours. We’ve been talking about this weekend’s storm system all week long. The models have come together quite well this morning as the different pieces of data are coming up with a fairly uniform solution. The forecast hasn’t changed much in the past 24 hours as we are still expecting a wintry mix with sleet and freezing rain causing the most problems. WREX was the only station in Rockford that participated in a special conference call with the National Weather Service in Chicago today. Their forecast is quite similar to what we have been talking about the past day or two. It still appears as though the precipitation will start early Saturday afternoon in the form of snow, but quickly switch over to a blend of sleet and freezing rain by mid to late afternoon. This outcome will cause the worst driving conditions between 4pm and midnight Saturday evening. They spoke about the possibility of an ICE STORM WARNING being issued later today or early tomorrow morning, but said they would hold off until the event got closer. They also spoke about the “worst case scenario”. In the “worst case scenario”, a half an inch of frozen precipitation would cover the WREX viewing area. This ice coupled with gusty southeast winds could create widespread power outages. Granted, this is the “worst case scenario”, but it is important to know that the potential does exist. The graphic above is of estimated precipitation totals from 6am Saturday through 6am Sunday morning. As you can see the bullseye for heaviest precipitation is very close to the Rockford area. As we teeter along the freezing mark near the ground and higher up in the atmosphere our precipitation will be changing its form frequently this weekend. 10:53pm – The going forecast looks good. We will start with a brief, but moderate, round of snow for Saturday afternoon before changing to freezing rain/sleet and rain. If anything, the evening models are decreasing our chance of freezing rain in favor of sleet. That would be a blessing! Sleet (ice pellets) are much easier to drive on versus rain freezing into ice. Adam will have coverage on Friday. Winter Storm Watch won’t be upgraded to a warning until Friday evening. The main threat with this winter storm will be in the form of freezing rain Saturday night. However, the precipitation will likely begin as snow in the mid-morning. 6:20pm – Winter Storm Watches in effect from Milwaukee all the way down near Tucson! This storm will affect millions of people this weekend. With the storm track appearing to likely go through Nebraska, central Iowa, and into Wisconsin we could be in for some nasty travel this weekend. The precipitation type will likely change several times Saturday and Sunday as our temperatures at the surface and overhead teeter along the freezing mark. Late in the day Saturday could be a scenario that is worse than receiving heavy snow. We’ve been talking about the possible storm tracks for this weekend’s storm for days now. Today, the models are beginning to converge on a solution that may take the center of low pressure very near the area Saturday night into Sunday (not a recipe for heavy snow here). So, here’s what I’m thinking right now: Light snow will begin sometime on Saturday (and possibly accumulate a few inches) as temperatures are expected to be well below 32°. Snow will mix with sleet before changing to rain or freezing rain Saturday afternoon/evening. East of I-39 will be warmer than western sections so I’ve kind of put a cut-off along I-39 for FZRA west and RA east. The higher possibility of accumulating snow right now looks to stay west of the Mississippi River. As the entire system pushes northeast on Sunday we should be able to cool enough to change everything that’s left over to snow with an inch or two possible. CAUTION: That’s how it looks right now. I know it’s easy to speculate on what we think we see in the models (and what we want to see) but this one is not a full-fledged snow event…not a total-rain event either. Precipitation type will be critical in determining the severity of the system and the impact it will have on travel. I’ve probably gone through a hundred maps and models today and my confidence in this forecast is still only around 50%. Stay tuned. Here is a look at the morning run of the GFS and NAM computer models. Since the NAM only goes out to Saturday evening, I took a few screen shots of both computer models valid at that time. What is interesting is how the GFS model is developing a closed area of low pressure over northern Kansas with widespread overrunning rain over much of the Great Lakes. The NAM model is slower to develop the low and in turn keeping the Great Lakes cooler and drier through Saturday evening. (Keep in mind that the 540 line is usually the rain/snow line). No Snow? Let’s Make Some! 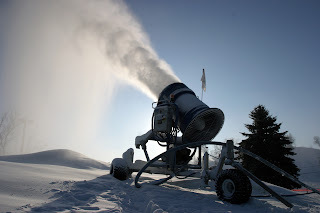 It talks about how cold the air must be to start making snow, the physics behind the process, the different types of snowguns, and much more. I hope you had the chance to see the beautiful sunset that we had over Northern Illinois on Tuesday. Both of these pictures were taken down in the Ogle/Lee County area. Special thanks to Scott Awalt and Sue and Bill Paulin for sharing!